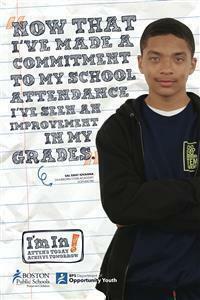 One of the ads in the “I’m In” campaign. The Boston Public Schools launched an advertising campaign on the MBTA this week to encourage chronically absent students to attend school, but one of the ads is marred by an embarrassing misspelled word. The missing “o” caught the attention of one rider of the No. 1 bus as it pulled up to a stop on Massachusetts Avenue Wednesday night, prompting her to snap a photo that she then posted on Twitter. “Not to be nitpicky, @BostonSchools but your new ad has misspelled ‘Sophomore’... awkward. #copyeditisdead,” she wrote. The school system teamed up with the Celtics and the MBTA on the “Stay in School” program, which is sponsored by Arbella Insurance Foundation, in an effort to boost student attendance. Some 14,000 students in Boston schools are chronically absent, meaning they miss at least 10 percent of the school year. Superintendent Tommy Chang unveiled the latest public service ad campaign — “I’m In: Attend Today, Achieve Tomorrow” — at School Department headquarters in Dudley Square Tuesday night. The 300 ads were produced in-house by the school system at a cost of $2,712, while the T donated the space for them.